Macquarie’s Base Metals Summit, a linchpin of LME Week for the past decade, was held today where an audience of over 400 market participants were polled on their views on the outlook for base metals over the next 12 months. 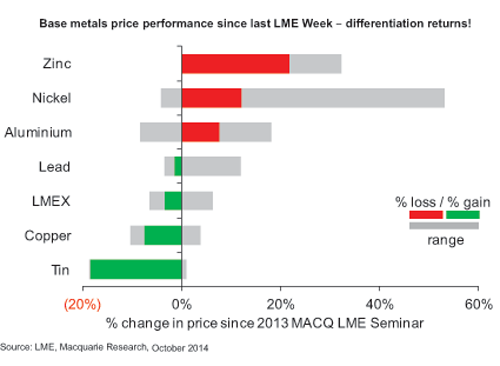 Providing a strong indication of market sentiment in the metals industry at the start of the annual LME Week gathering in London, the 2014 Macquarie LME Week Summit Survey indicates that market fundamentals will continue to drive differentiation across base metals, though macro headwinds are increasingly a concern. The results also show a large swing in participant preference towards nickel , despite weak recent performance. In contrast, copper is now the favourite short for the first time since the global financial crisis on strong supply growth. Commenting on the results, Macquarie’s Head of Commodity Research, Colin Hamilton said “The results reflected confidence in the 2015 story for nickel, while the market seems well aware of the supply headwinds facing copper”. • 46% of the audience expected the global economy to be moderately weaker over the next 12 months, while 35% expected it to be much the same. Only 7% predicted a growth shock. • Global metals demand is expected to grow modestly in 2014 by 47% of the audience, while 24% think it will contract – a figure much higher than the 2013 summit. • 77% of the audience expects Chinese GDP growth to drop below the 7% mark in 2015. • 36% of participants believe the impact of global deflation will be the key theme being discussed by the market in mid-2015. 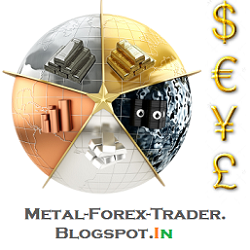 • 40% consider the volume of ‘invisible’ metal stored off-market as the biggest problem in current base metals markets. • When asked in which metal they would most like to hold a short position on a 12-month view, copper was the favourite for the first time in 6 years, while zinc was the least preferred short. • When asked in which metal they would most like to hold a long position on a 12-month view, nickel took 47% of the poll (up from 10% in 2013). In contrast, only 7% voted for copper. • Delegates think that another co-ordinated global easing is the biggest risk to the upside over the next 12 months, while a China collapse presented greatest downside risk. • The audience's weighted average price expectation for cash copper was $6,663/t a year from now, compared with Monday's LME official price of $6,615/t. This is 9% lower than 2013 Summit expectations. • 53% expected the copper market to take until 2017 or beyond to move back to deficit. • The audience's weighted average price expectation for cash aluminium was $1,997/t a year from now, compared with Monday's LME official price of $1,955/t. This is 5% higher than 2013 Summit expectations. • A flood of Chinese supply is viewed as having greatest potential to cause aluminium inventory unwind. • The audience's weighted average price expectation for cash nickel was $19,859/t a year from now, compared with Monday's LME official price of $15,315/t. This is 12% higher than 2013 Summit expectations. • The majority of the audience expected the Indonesian nickel ore ban to stay in place over the coming year. • The audience's weighted average price expectation for cash zinc was $2,325/t a year from now, compared with Monday's LME official price of $2,223/t. This is 9% higher than 2013 Summit expectations. • The majority of participants expect some Chinese mine supply growth in 2015, but only when incentivised by price. • The audience's weighted average price expectation for cash lead was $2,137/t a year from now, compared with Monday's LME official price of $2,012/t. This is 6% lower than 2013 Summit expectations. • The audience's weighted average price expectation for cash tin was $19,809/t a year from now, compared with Monday's LME official price of $19,400/t. This is 25% lower than 2013 Summit expectations.